A new style of portable exhibition structure has been developed by Tectoniks and we are offering a substantial discount on the first one to be sold. The structure is a low-profile dome (its height is less than half its diameter) and provides a 25 metre diameter internal space. There are four large openings which can be configured with various styles of doorways from simple fabric flaps to rigid quadruple doorsets. 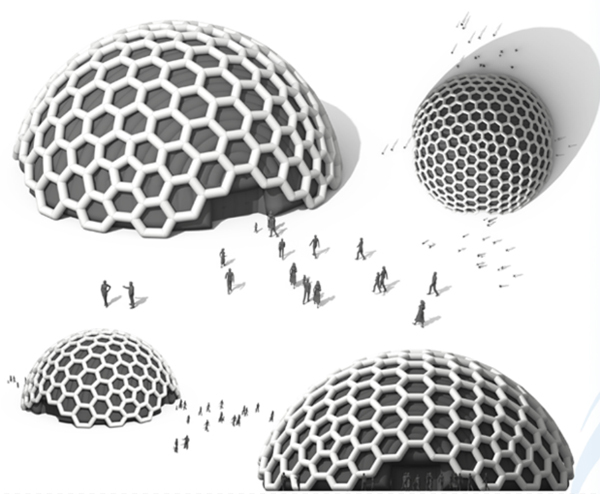 The really exciting aspect of this structure is that it is designed to support a detachable, inflated honeycomb ‘exoskeleton’, giving it a totally unique appearance. The dome has a white interior and a grey exterior which is designed to provide an effective contrast with the white ‘exoskeleton’. If preferred, the dome can be supplied without the ‘exoskeleton’.